Give time a break. 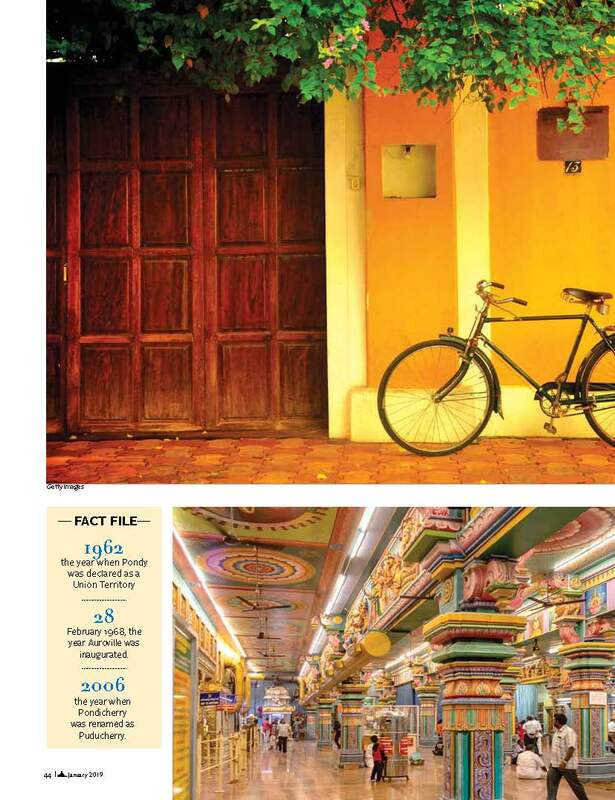 The tourism department’s tagline for Pondicherry could not be more apt. 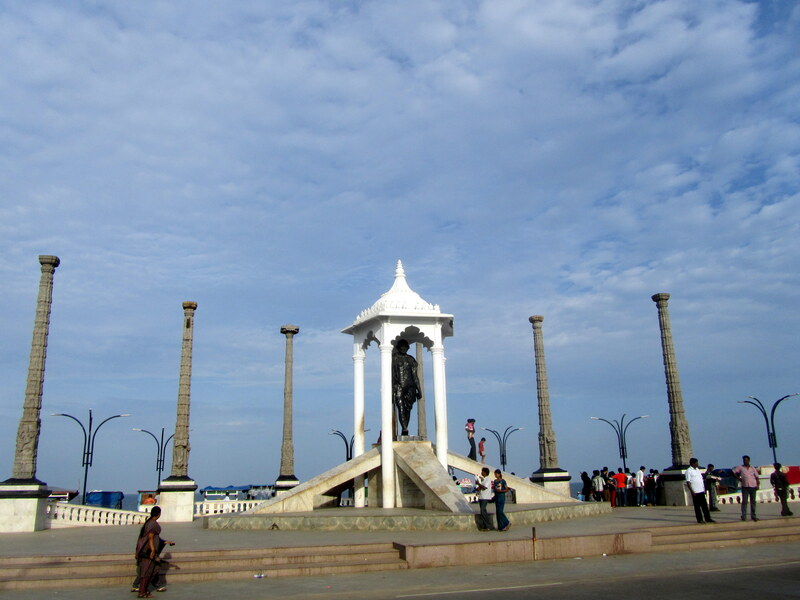 The only Union Territory located in the south of India, Pondicherry or Puducherry as it is now called was once a French colonial settlement. Today it is a small town that merges its French legacy with contemporary urban life seamlessly to create an alluring character that draws you back again and again. Home to probably the only international community living space Auroville, Pondy (a colloquial reference) is certainly like no other. 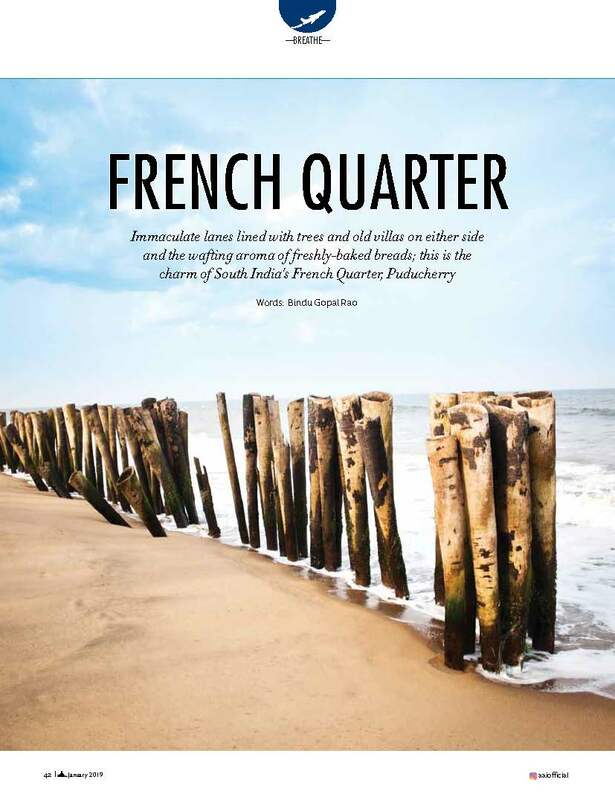 From the beach front seaside promenade that offers stunning views of the mustard hued colonial villas and chic boutiques, there is something enduringly charming about this beach town. So on your next visit do make sure you experience the sights and sounds of the city in its entirety. The ashram and everything to do with its founder Sri Aurobindo is what gives Pondicherry its unique character. Built in 1926, this place is thronged by visitors who are not just spiritual seekers. Even while you are requested to maintain silence, the calmness of this place, the beautiful setting amidst nature and the plethora of flowers that cover the resting place of the saint will leave you feeling calm and serene. 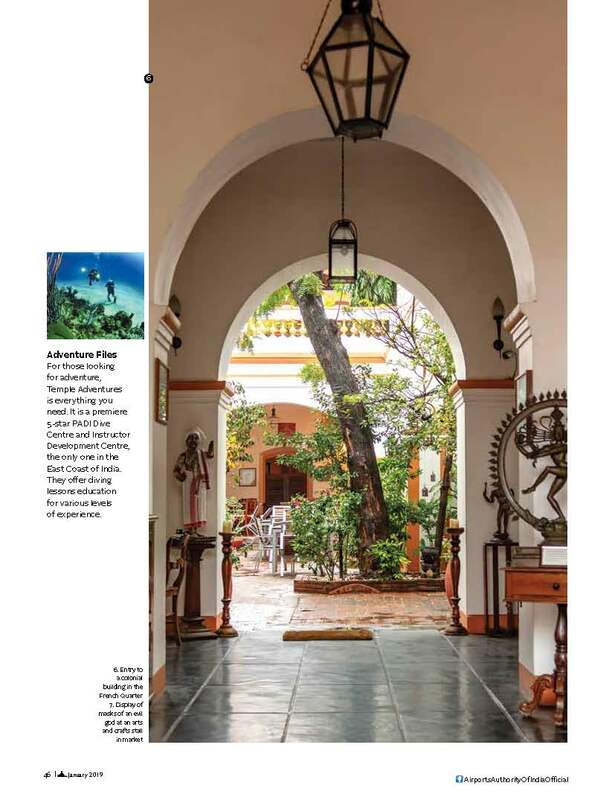 Located in the white town in the French Quarter, the ashram must be on your to do list while you are in Pondy. A temple dedicated to India’s most loved God – Ganesha, the Manakula Vinayagar Temple is close to the Aurobindo Ashram and in contrast is a hub of bustling activity. Interestingly, this temple is said to have ben existence even before the French colonised Pondy before 1666. 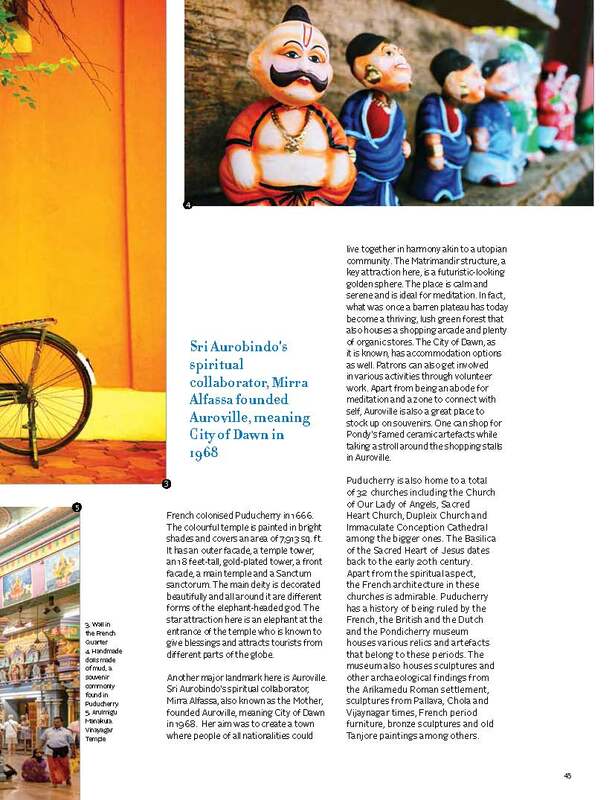 The colourful temple is painted in bright shades and covers an area of 7913 sq. ft. and has an outer facade, a temple tower, an 18 feet tall gold plated tower, front facade, main temple, Sanctum sanctorum and other areas. The main deity is decorated beautifully and all around the same are different forms of the elephant headed god. A star attraction is an elephant at the entrance of the temple who will bless you if you give her a coin! Sri Aurobindo’s spiritual collaborator, Mirra Alfassa, also known as the Mother, founded Auroville, meaning City of Dawn in 1968. Her aim was to create a town where people of all nationalities could live together in harmony akin to a utopian community. The Matrimandir structure a key attraction here is a futuristic looking golden sphere and the place is a calm and serene and is ideal to meditate. In fact what was once a barren plateau has today become a thriving lush green forest and today also houses a shopping arcade and organic stores as well. The city of dawn as it is known has places to stay and you can get involved by volunteering for the various activities that happens here. This is a great example of international community living and you can even pick up some of the famed ceramic artefacts while you are here. The coastal town has four main beaches. At the centre of town is the Promenade beach which is a favourite with locals and tourists alike. In fact traffic is banned during specific hours to allow locals to enjoy the sea. There is a walkway on one side that is a favourite with walkers and the other side is dotted with restaurants, shops and hotels. The French War Memorial is a simple construction of four pillars built in memory of French soldiers who lost their lives during World War I. A statue of Mahatma Gandhi is also close by and is surrounded by 8 monolithic granite pillars dating back to 17th century. The other beaches that are away from the city are the Paradise beach, Auroville beach and Serenity beach that are well maintained. At the Chunnambar Boat House, you can hire a boat and take a ride around Paradise beach. And of you are here at dawn, you can witness a magical sunrise and the sight of the sun rising against the waters is beautiful. 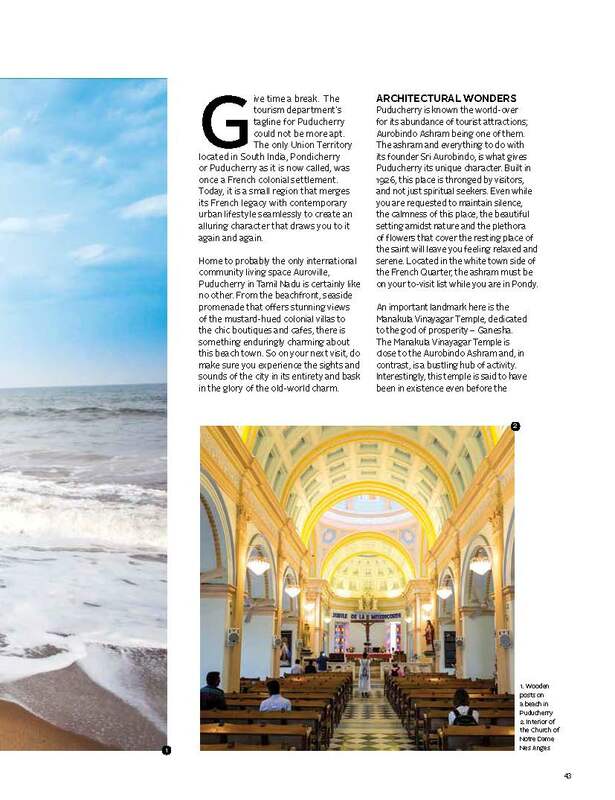 There are a total of 32 churches in Pondicherry including the Church of Our Lady of Angels, Sacred Heart Church, Dupleix Church and Immaculate Conception Cathedral among the bigger ones. The Basilica of the Sacred Heart of Jesus dates back to the early 20th century is a Catholic Church and has a Beautiful neo-gothic design. Apart from the spiritual aspect, the French architecture in these churches is admirable. 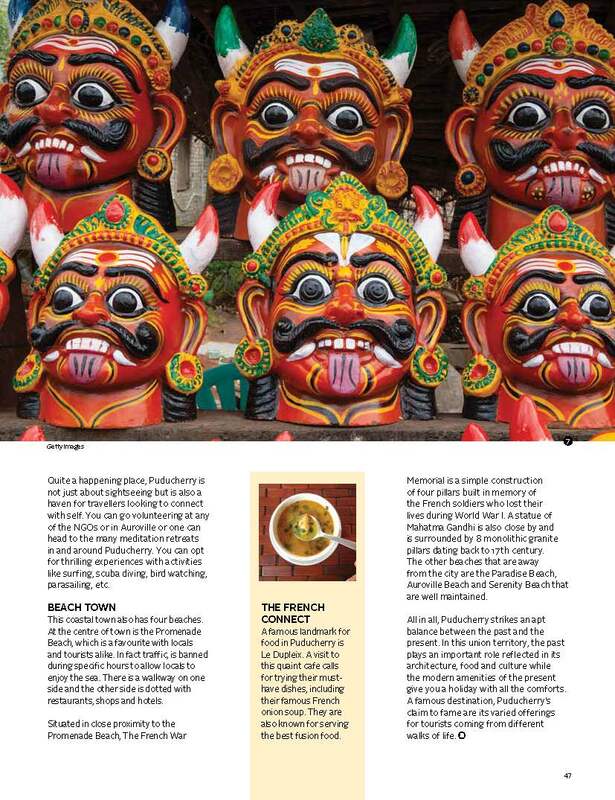 The cuisine of Pondicherry perfectly blends South Indian and French sensibilities. There are several cafes that specialise in French food that are actually run by French who have settled here for decades. You can also enjoy a lot of fresh seafood as well as traditional South Indian staples while you are here. Also look out for artisanal food choices at many of the boutique restaurants in the city. 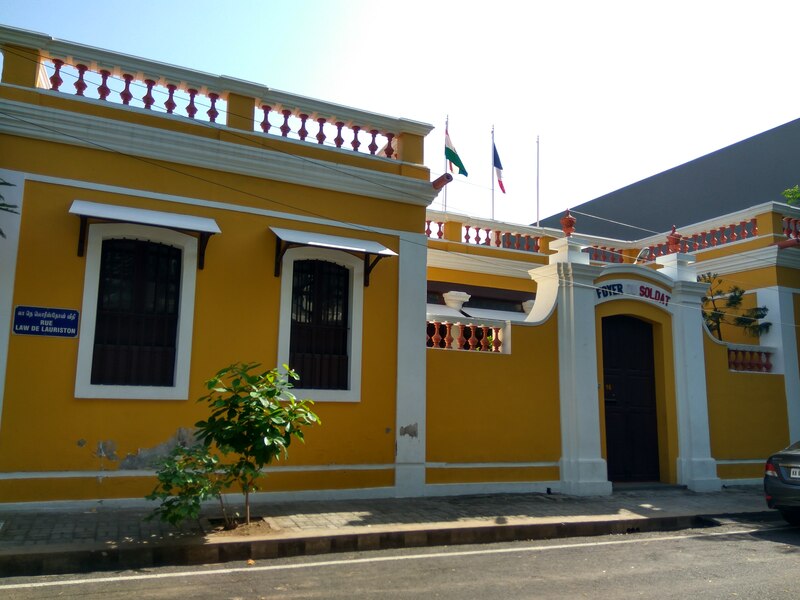 Pondicherry has a history of being ruled by the French, the British and the Dutch and the Pondicherry museum houses various relics and artefacts that belong to these varied periods. The museum also houses sculptures and other archaeological findings from the Arikamedu Roman settlement, sculptures from Pallava, Chola and Vijaynagar times, French period furniture, bronze sculptures and old Tanjore paintings among others. A famous landmark, the defunct Old Lighthouse was built in 1836 and is a very interesting tourist attraction. Ousteri lake slightly away from Pondicherry is a heaven for birdwatchers as several migratory birds visit this in the season. The ruins at Arikamedu located outside Pondicherry have artefacts from ancient Rome like sculptures, glassware, lamps and gems. Scuba Diving is a popular sport especially during February-April and September-November. Sign up for a chocolate tour with an artisan chocolate maker. Explore the wonderful range of cheese available in Pondicherry.